1542: Juan Rodríguez Cabrillo commands the first Spanish ships into Santa Monica Bay. 1781: Spanish governor Felipe de Neve establishes the pueblo of Los Angeles. Next Tuesday: Melrose gets some good paella. 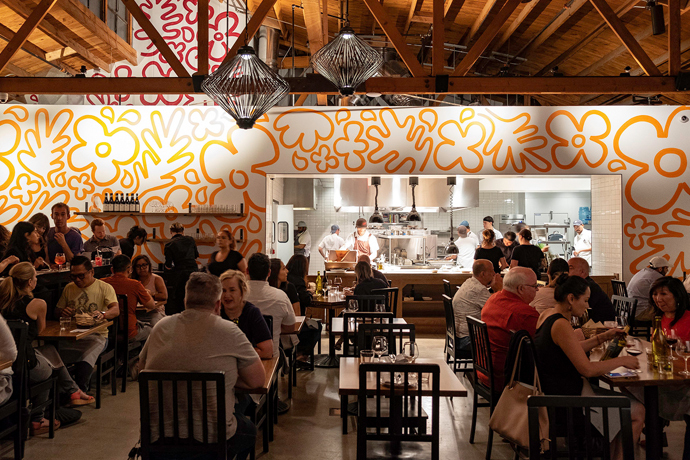 Witness the rise of Smoke.Oil.Salt, a new Melrose source for Spanish wine and Valencian paella from former Lazy Ox chef Perfecto Rocher, soft-opening Tuesday in Hollywood. It’s the kind of rustic old tavern where Sancho Panza might have refilled his bota, if he lived in the hills and rode a hybrid. All bare bricks, red walls and dark wood, with a large wood-burning oven roaring behind the bar. Spain equals romance. So by the transitive property, this place equals dinner date. You’ll bring someone who knows the difference between court-painter Goya and bean-can Goya, then tuck yourselves into the wine bar on the left for some rioja or cava-based cocktails. Once your two-top is ready, over on the right, you’ll accrue a bottle of something good, along with welcome slabs of ibérico pork shoulder and tenderloin with romesco and Valencian paella. Take your time. You’re not going anywhere. Not until you’ve ordered the sea urchin flan with shrimp oil and fried capers to share. So they always think of you when uni flan comes up.